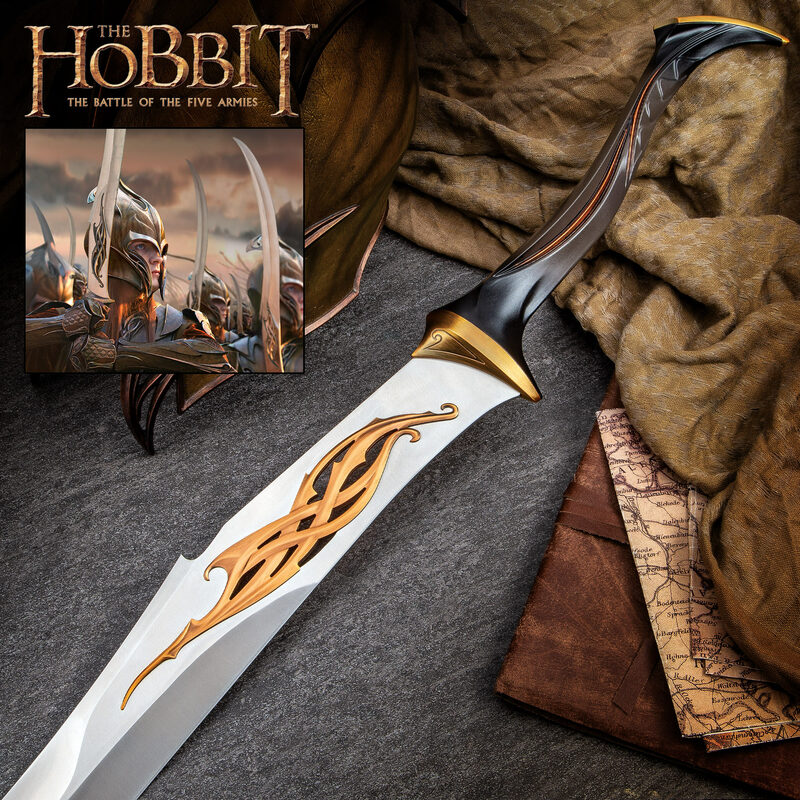 Take hold of our Silvan Elves sword and join forces in Mirkwood Infantry! Our official Silvan Sword reproduction is every bit as stunning as in the movie and comes complete with certificate of authenticity. 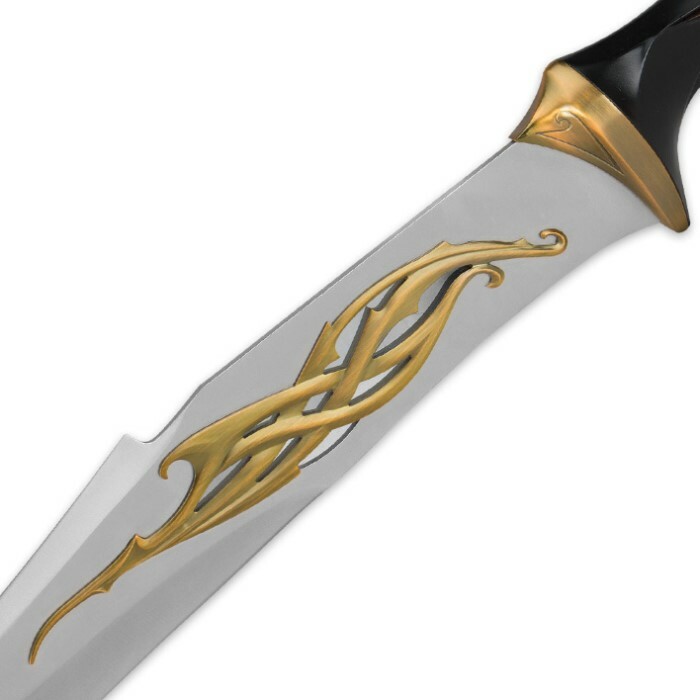 A corner stone of this Elven sword design is the interlocked ornament at the base of the blade. Finished in bronze, this piece is matched by engraved details set into metal accents on either end of the hilt. Other features include the curved two handed grip and a large stainless steel blade with Elven geometry, down to the curved point. Includes wooden wall display plaque with screen printed artwork. Measurements: 34 5/8 in. blade, 47 3/8 in. overall. The Mirkwood infantry sword is as big as the High Elven sword from the "Lord of the Rings" collection. Amazing in detail and craftsmanship. Truly a "must own" for your Elven Armory. This sword arrived two days ago. Oddly enough every time I see the box I think, geez that looks small. Once opened and out of the box this sword IS A BEAST! Like Steve said in his review, it is much bigger than you would expect. It had the size and thickness of the Elven Warrior Sword, but with more blade. 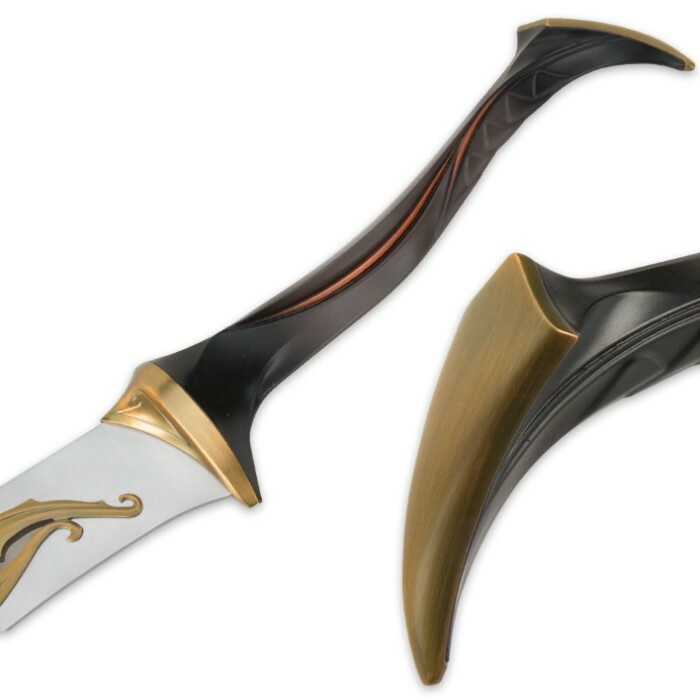 It has open blade work like Tauriel's knives and a thin but long grip somewhat reminiscent of Orcrist. Well worth the purchase. Well ? It finally arrived. . . And well worth the wait. The Mirkwood Infantry Sword is awesome . . Im very happy with it and look foward to seeing what wonderful Replicas are next from The Hobbit Movies. My sword arrived today after much anticipation and several shipping delays. The shipping delays were not the fault of Budk they shipped the item promptly but after missing 2 delivery dates FedX handed it off to the post office for delivery. After opening the sword I was completely blown away. This sword is so much bigger than the picture leads you to believe. I own every replica United Cutlery produced for Lord of the Rings and several replicas from the Hobbit. This is the best sword they have released for the Hobbit so far. I recommend this sword to anyone who plans on buying a replica from this movie. This Sword will be a very nice addition to any collection. But Im hoping they make the open sheath that should go with it.